Mothernode gives users the ability to send emails from within their Customer, Contacts and Lead and Opportunity records. The advantage of this process is users can use predefined email templates that can include merge fields from their Mothernode database tables. All emails sent from within Mothernode are copied to the user’s account. NOTE: This process is independent of Mothernode’s Marketing Automation. In order to send emails from within Mothernode, users will need to configure their SMTP Settings in their user accounts. This process will not only allow users to send emails, the emails will include all the user’s reply to information replicating the experience of sending the email from their main service, like Outlook or Gmail. IMPORTANT: If you are using port 25 for SMTP settings you must enable ports 465 or 587 on your mail server to allow Mothernode to effectively relay email on your behalf. Port 25 will not work. Mothernode cannot send emails via your mail server using port 25. Setting up your SMTP setting in your user account. * IMPORTANT: You will need to know your email settings to proceed with these directions. 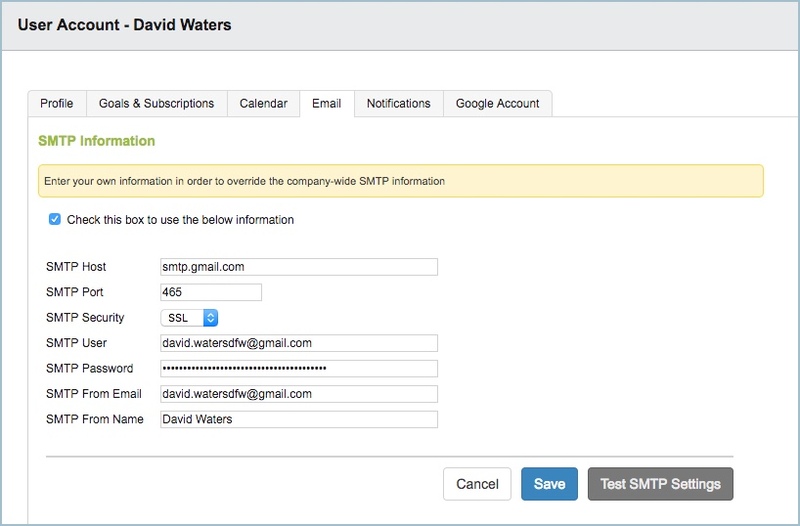 After adding the information, click the SAVE and then TEST SMTP SETTINGS. The test results will appear in a light window. For assistance with your email account and settings, contact your email administrator. Once your configurations are correct and final you can send emails from Mothernode that will include your from address. Gmail users who are using 2-Step verification and other security measures may need to set their GMail account to allow less secure apps access to your account. Other possible issues are list below.